Most homeowners have no idea what goes on inside their home's air ducts. But the fact is, they can become littered with years of accumulated dirt, debris and allergens like pollen, dust and pet dander. Industry standards recommend that you have your air ducts inspected every 2 years for cleanliness, and have them cleaned, on average, every 5-7 years. Of course, this will vary with the conditions in your home. Don't be fooled by cheap imitations that are too good to be true. The following statement is taken from the NADCA (National Air Duct Cleaners Association) web site, nadca.com. 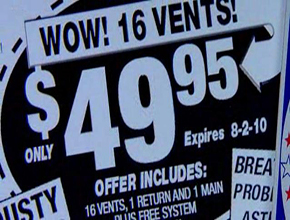 "The Environmental Protection Agency says that "duct cleaning services typically, but not always, range in cost from $450-$1,000 per heating and cooling system, depending on the services offered, the size of the system to be cleaned, system accessibility, climate region and level of contamination" and type of duct material. Consumers should be aware of air duct cleaning companies that make sweeping claims about the health benefits of duct cleaning, such claims are unsubstantiated. Consumers should also be aware of "blow and go" air duct cleaning companies. These companies often charge a nominal fee and do a poor job of cleaning the heating and cooling system. These companies may also persuade the consumer into unneeded services with and/or without permission." We are committed to providing the highest quality duct cleaning in the industry! Our complete air duct cleaning package starts with our courteous, insured, and professionally trained technicians who will use the following process as recommended by the Air Duct Cleaners Association (ADCA). Our technicians will clean all registers/ grilles, and the entire air duct system using powerful vacuums, specialized tools and compressed air to blast dust and debris from the duct walls. Our technicians will then sanitize your air duct system to reduce or eliminates odors, mold, and bacteria throughout your duct work. Our technicians will then put the air duct system back together and vacuum your entire home with our HEPA filtered Vacuum's. Ensuring your home is cleaner than when we arrived. Mold thrives in the cool, moist interior of the central air system. 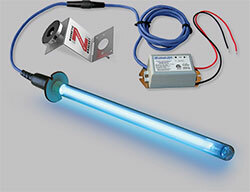 UV LIGHTS are proven effective at sterilizing mold and other biological contaminants. 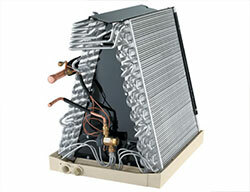 Moldy coils shorten the life of the air system and waste energy by reducing efficiency. 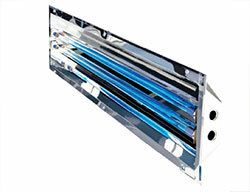 Blue-Tube UV kills the mold and reduces the need for system maintenance. 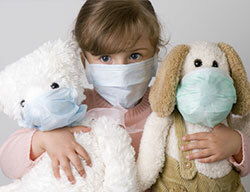 According to the EPA indoor air pollution is often five times worse than outdoor and represents a significant health risk. UV LIGHTS improve indoor air quality by sterilizing mold, bacteria, viruses, and allergens from the air as it cycles through the central air system. For over a century scientists have known about the germ-killing properties of UVC light. Because this frequency of light is filtered out by the Earth's atmosphere microorganisms have no defense against it. It works by scrambling their DNA which prevents them from reproducing. UVC light works by penetrating the cell walls of microorganisms and scrambling their DNA. This prevents them from reproducing.